Should I Take My Bird to the Vet if Nothing's Wrong? Do Birds Need Annual Vet Visits? Question: My Budgie, Kipper, is only a year old, and I just adopted him last week. A friend of mine who has dogs told me that I should schedule a visit to take him to the vet, but Kipper doesn't seem sick at all. In fact, he's a normal, happy Budgie and seems to be as healthy as can be. Vet visits can be expensive, so I really don't want to have to take him in unless it's absolutely necessary. I'm a college student, so I'm living on a budget! Is it really as important for me to take Kipper to the vet as my friend says it is or is she just exaggerating? I understand that her dogs have to go for their vaccinations, but birds don't need any yearly shots, so the whole thing just seems unnecessary to me. Answer: Congratulations on adopting Kipper and welcome to the wonderful world of bird ownership! Budgies are certainly wonderful little birds, and with proper care, you are sure to have many happy years with your new feathered friend. The key to this, however, is proper care! Your friend is absolutely right about the need for you to schedule a vet visit for Kipper, and I will explain why. 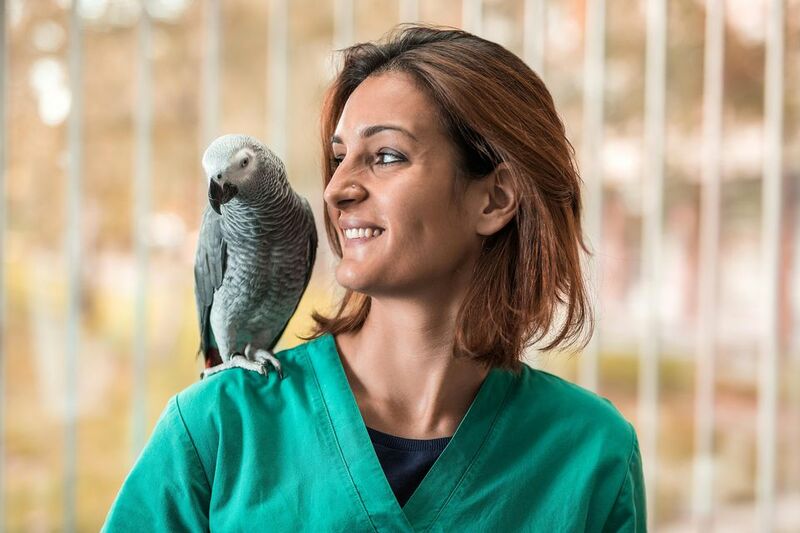 As a new bird owner, your first priority should be to find an avian vet that you trust and start to build a good relationship with them. You are Kipper's guardian now, and it's up to you to make sure that he will have the best healthcare possible in the event that he gets hurt or becomes ill. Scheduling a vet visit just to get him checked over is the best way that you can start off on the right foot. You never know, Kipper may now have very subtle symptoms of a problem that only a trained avian veterinarian would recognize. It's always a good idea to get a check-up done anytime you adopt a new bird, just to make sure that there aren't any hidden problems. When a bird is sick, they are naturally very good at hiding any signs of weakness -- in the wild, they would surely be targeted by predators if they didn't. Unfortunately, this defense mechanism works to our disadvantage with birds in captivity, because it can make it harder to know when there is a problem that needs to be addressed. It's true that vet visits can be costly, but the fact is that scheduling a checkup for Kipper now could potentially save you a lot of money in the long run. If it were to turn out that Kipper did have some sort of illness or disease, catching it earlier would mean less costly treatments than it would if the illness were allowed to progress. Plus, it would save you the heartache of knowing that you could have stopped him from becoming so sick if you would have just taken him to the vet, to begin with. You can't put a price on that! As you can see, the benefits of scheduling Kipper for a vet check up far outweigh any potential cons. This is something that you should, as your friend suggested, do every year whether or not your bird experiences an illness. It just makes sense to be absolutely sure that there are no problems with your feathered friend's health, and that your bird is as healthy and happy as possible. There are plenty of other ways to save money on bird care without sacrificing your pet's health. Tapping into your creative and resourceful sides will help you keep Kipper's well-being your top priority.